City University Careers, Student Development and Outreach unit offers various extra-curricular activities (from volunteering through personal mentoring and more) to students that are aimed at helping them develop their employability. While there is a wide array of activities on offer, these activities are not collected centrally anywhere on the main City website. This presented an obstacle for students who wanted to join this type of activities but weren’t aware of them or didn’t know how to access relevant information about them. 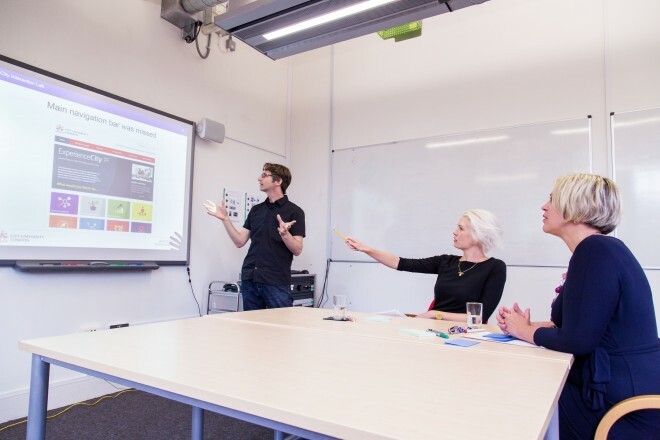 Following this issue, we were asked by the careers services unit and the digital agency Fabrik to help them design a new student careers portal. The project had tight time schedule and only had a short window during summer break for research, design and implementation. We ran the project following a shortened version of the UCD process with activities strategically chosen to ensure we met the deadline. We identified main goals and needs, interviewed prospective users of the website and designed a new careers related activities portal for the students. We started off with interviews and requirements gathering. General goals and initial requirements were obtained from main project stakeholders such as the careers services unit managers and interviews were conducted with prospective users of the website in order to collect their main needs. We also created main user journeys and primary personas to inform the design. We later continued to the iterative design phase. The available activities were broken down to categories, and a basic information architecture was constructed. This was followed by detailed wireframes of the website’s main pages. In order to verify our first design we constructed a low fidelity prototype and tested it with 4 participants while focusing on the main journeys in the websites as well as obtaining general feedback on the site’s structure and content. Recommendation we made based on the testing results which led to a simpler information architecture of the website and various textual / labelling changes that were aimed at making the site’s purpose clearer to its prospective users. Based on the wireframes and the recommendations from the user testing a responsive graphical user interface was designed and implemented by fabric. Later, a second and final round of testing was conducted on the fully functioning and designed website with 4 participants. The testing was done on mobile and desktop versions of the site. Overall the project displayed a good application of the UCD process. Starting from clear definitions of project’s goals, through user-research and an iterative design and testing stages and ending with a well-designed and structured website that answers students’ needs. The website aired on September 16, 2014 towards the new academic year and further modifications may be done according to students’ feedback after full exposure.